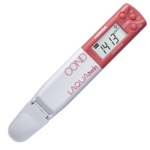 The only pocket meter that directly measures conductivity in 0.12ml sample. No need for a beaker to calibrate your meter or measure a sample. Just place few drops of the standard or sample onto the sensor. This procedure saves you time and prevents wasting your precious sample.